The Kawasaki A1 Samurai was a hugely popular motorcycle in the late 1960s and early 1970s, especially in the United States. Although sold only between 1967 and 1971, the A1 Samurai played an important role in the future success of the Japanese high performance motorcycle company. Two years after taking over the Meguro motorcycle company (in 1963), Kawasaki introduced the W series which was very similar to the British vertical-twin motorcycles. However, the W series wasn’t as successful as expected and Kawasaki developers soon realised that they need to make a bike which will be able to compete with better steering and lighter yet faster rival motorcycles. The Japanese bike maker almost immediately started developing a new motorcycle and in 1967, Kawasaki unveiled the A1 Samurai that was made for foreign markets, most notably the United States. 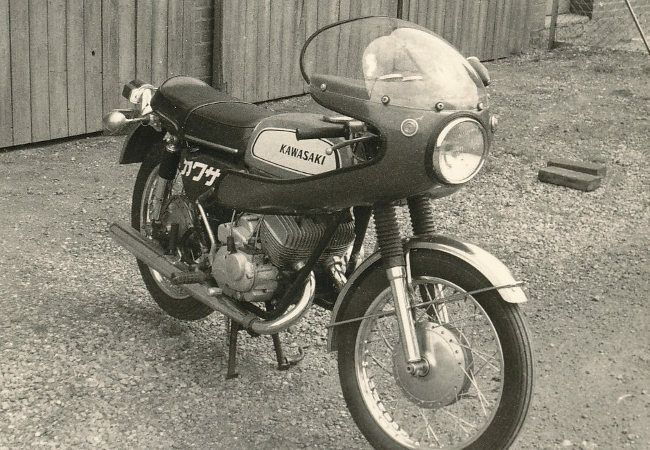 The lighter, faster and better steering motorcycle was a major success and Kawasaki soon introduced more powerful A7 Avenger which was also sold from 1967 to including 1971. 1967 A1 Samurai. The early models came either with candy blue or candy red colour, black frame and chrome parts. 1968 A1 Samurai. Colours remained unchanged with the exception of fuel tank that was painted and included a “KAWASAKI” inscription on the top. 1969 A1 Samurai. The colour scheme remained unchanged. The thing that sets the 1969 models apart is the fuel tank with oval sides painted white and “KAWASAKI” inscription along the tank as opposed to 1968 model with the logo on the top. 1970 A1 Samurai. The 1970 series came with candy red and white colour scheme. Tank was painted red and white (sides), and featured a distinct indentation. 1971 A1 Samurai. The last in the A1 Samurai series largely followed its predecessors’ style with the exception of the fuel tank which was completely flat. The Kawasaki A1 Samurai and A7 Avenger looked very alike but there was one major difference between the two bikes – the engine. While the A1 Samurai had 250cc engine, the A7 Avenger came with a twin-cylinder, two-stroke, dual rotary valve, oil injected 350cc engine.